"I felt complete confidence; that I was in great hands. I was impressed by how efficiently the whole process was handled right from the first clinic appointment for the first eye to the last appointment for the second eye; and I was amazed that Mr Horgan game time to phoning to check the following day!" "The readiness of all involved to answer any questions and the ability to speak to Lorraine when I wanted to alter an appointment or indeed arrange one; and the hand holding during the procedure." "The vast improvement in my vision! The speed that I got an initial consultation. Pre-surgery and post operative access to Mr Horgan to answer questions an ally concerns. I also appreciated the support and access to Anne Rumbleow, who was progessional and kinf throughout. Thanks you." "I thought every aspect of the treatment was excellent .. very professional. The whole treatment carried out by various members of Mr Horgan's team was to a very high, professional standard. Could not be faulted." "Friendly, professional, understanding, reassuring, highly competent. Very highly recommended." "Mr Horgan gives you his undivided attention and you can ask him anything." "I was treated as an individual with warmth and respect. The prospect of eye surgery was daunting but I had total trust in Mr Horgan and his team from the initial consultation"
"Friendly greeting and reassurance. I was pleased by the way I was looked after by staff, throughout consultations and procedure." "I felt I was fully informed at all stages; any questions I raised were dealt with. A very professional and competent practice." "The whole of his team, including his practice nurse, Anne and PA, Lorraine were always courteous, approachable and sympathetic. They all go above and beyond their actual job, a fantastic team. I always felt safe and would not hesitate to recommend anyone to Simon Horgan and his team. I would also like to praise the staff at the New Victoria hospital and the efficiency of them all." "Lorraine Williams helped enormously in dealing with AXA/PPP and any of the questions that I had, at all times with the utmost good cheer and courtesy." "I felt that everyone cared about me and totally wanted my treatment to be successful. My whole experience with Mr Horgan and his team was delightful and the end result was very successful." "From the moment I arrived at Simon Horgan’s practice for my consultations and procedures, I was treated very well by everyone. Now, thanks to Simon Horgan’s practice I can see much more clearly. " "It would be remiss of me to part company without expressing my grateful thanks to your entire team and, in particular, the highly talented and skilled Simon Horgan, for all you have done for me. The procedure is daunting but it all seemed to happen effortlessly, which is a testament to the efficiency of all involved." "The results have exceeded my expectations and the outcome has been as good as, if not better, than I had anticipated from my consultations with Simon Horgan. The whole of his team, Anne Rumbelow and Lorraine Williams especially was pleasant and reassuring at all times." "From start to finish it was a fearless experience and the way that the medical staff dealt with it removed the fear of undergoing procedure." "There was much reassurance given by Mr Horgan and his team. I felt very comfortable in their care." "Everyone on the team was professional, empathetic, available, skilful and always friendly." "I liked Mr Horgan’s courtesy, good humour, kindness and readiness at all times. He performed the operations with skill and delicacy." During the weeks commencing 8th and 15th April, our Practice Manager will be taking some annual leave meaning the office is operating on reduced hours. You can, as always, phone and select option 1 to make, alter or cancel appointments at the New Victoria Hospital, or option 2 to reach our Practice Nurse for medical enquiries, or leave a message for general enquiries and appointments and your call will be returned after a day or so. Thank you for your patience. "We believe everyone deserves a courteous, friendly and efficient service. We pride ourselves on appointments that keep to time and to carefully explaining eye conditions and their treatment." Eye Health Care is the professional name for Simon Horgan’s private practice. 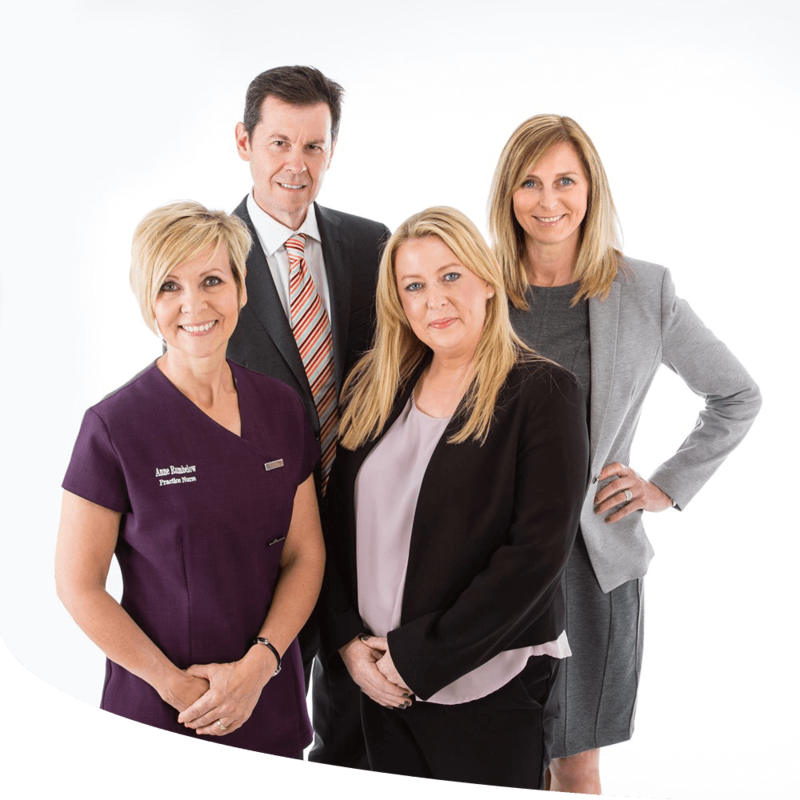 We are a team of dedicated and proficient health care professionals specialising in eye care. Choosing a surgeon to operate on your eyes can often be a daunting experience, particularly if you do not have a personal recommendation or previous experience of any eye condition. The aim of this website is to provide you, the patient, with clear, concise information to help you with your decision.